OpenRoad has helped hundreds of thousands of satisfied customers just like you with refinancing their current car loan as well as with purchasing the new or pre-owned car, truck or SUV they have always wanted. 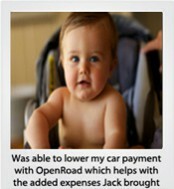 At OpenRoad we pride ourselves in being the customer’s advocate and have a 98% customer satisfaction score to prove it! Don’t just take our word for it, please take a minute to browse through just a few of the hundreds of actual customer testimonials and then create your own story. 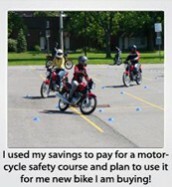 We thought it would be fun to ask our customers what they are doing or plan to do with the money they save by refinancing. If you are considering refinancing but are wondering if it’s worth the effort then take a look at what these actual customers had to say. 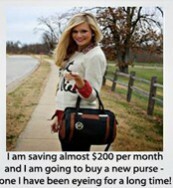 Whether you save $30 or more than $100 per month – that money goes back in your pocket! 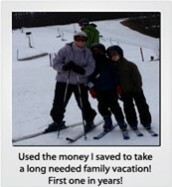 Click here to see more stories and let us know what you intend to do with the money you save! For any questions, please contact our Loan Care Agents toll-free at (888) 536-3024. Ready to get started? Just click the Apply Now and Save button below and you are on your way!